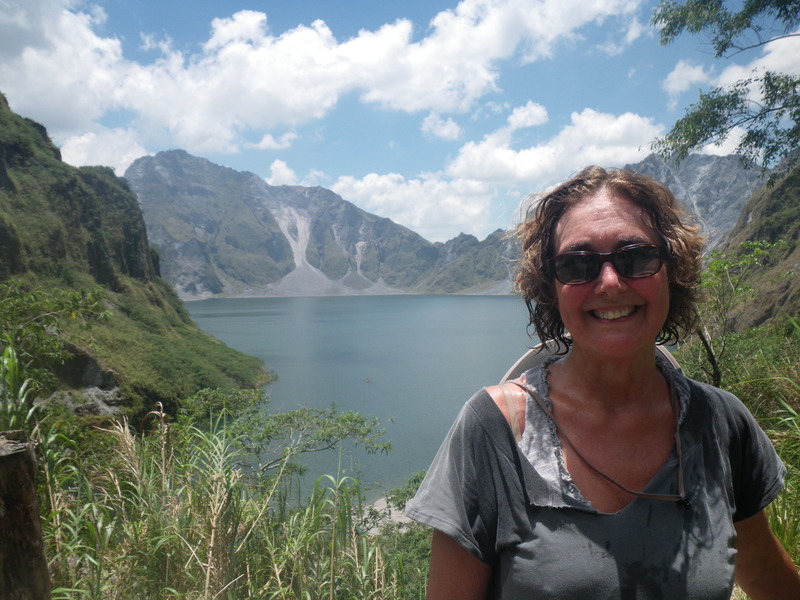 A few weeks ago now, while Helen was visiting us in April, we went hiking at Mount Pinatubo. It’s something I’ve wanted to do for a long while, but it takes some organization and prior planning. I had visited the area earlier, but we only viewed some of the devasation it caused to a local church. This time we were going to get a close up look at the volcano itself. It’s a pretty unique opportunity. 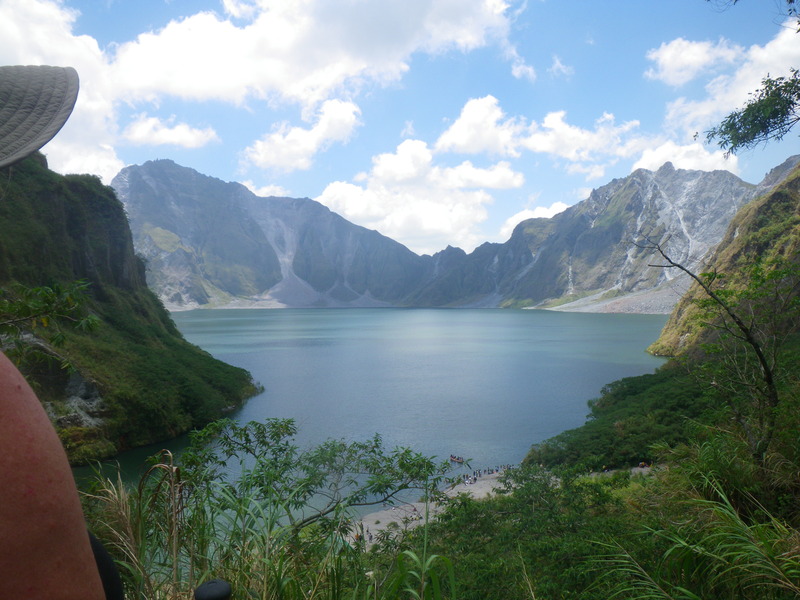 Mount Pinatubo is a volcano which erupted in 1991, causing the second largest volcanic explosionn of the 20th century. Its eruption coincided with the heavy rainfall of Tropical Storm Yunya, which amplified the devastation significantly. The eruption lasted 9 hours, caused two earthquakes, and the erupting lava mixed with the excessive rain resulting in 10cm of ash covered an area of 2000 square kilometers, killing more than 800 people. Half a billion dollars in property was destroyed and entire communities were wiped out. 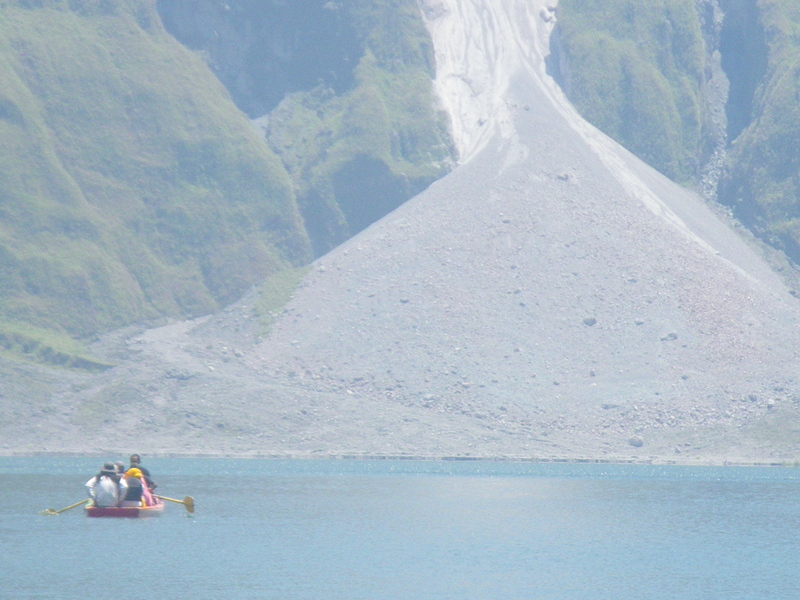 The top of the volcano collapsed creating a massive caldera, which today is a large lake. 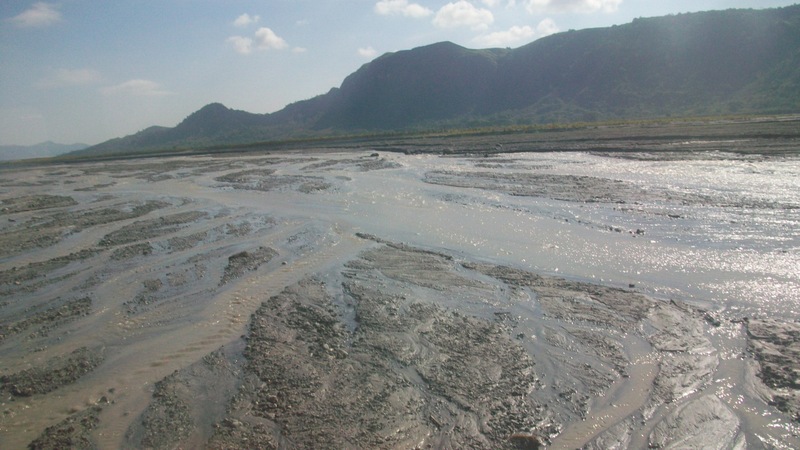 Today the journey from the outskirts of the devastation to the lake is across a lunar-like landscape, broken up by multiple riverlets running down from the caldera lake. 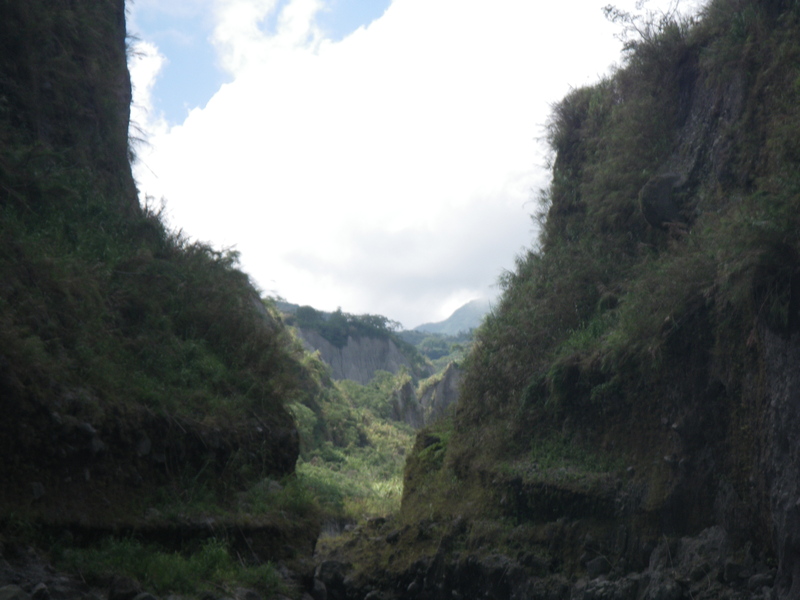 The first part is covered via jeep for about an hour, as it can only move at a very slow place across the rocky boulders and river beds. An hour out, the journey moves to foot. Rattled from the jeep experience, and under the burning sun we walked for almost three hours to reach the lake. The ascent is gradual, and the path is relatively straightforward. But that doesn’t make it easy. There’s lots of scree and its easy to slide on the loose gravel, and it was particularly hot that day. The sun came out and stayed out. I wore a hat but felt like my brains were being boiled! There was very little shade. It took almost three hours to reach the last part of the journey, up some steep steps to the plateau in front of the lake. A victorious smile from Helen who was a trooper! I was dismayed to see that there was little shade at the top, which was occupied by others, and it was another steep climb down to the actual lake shore, which meant another climb back up. We took a little rest and a food break and found the energy to go down to the shore. 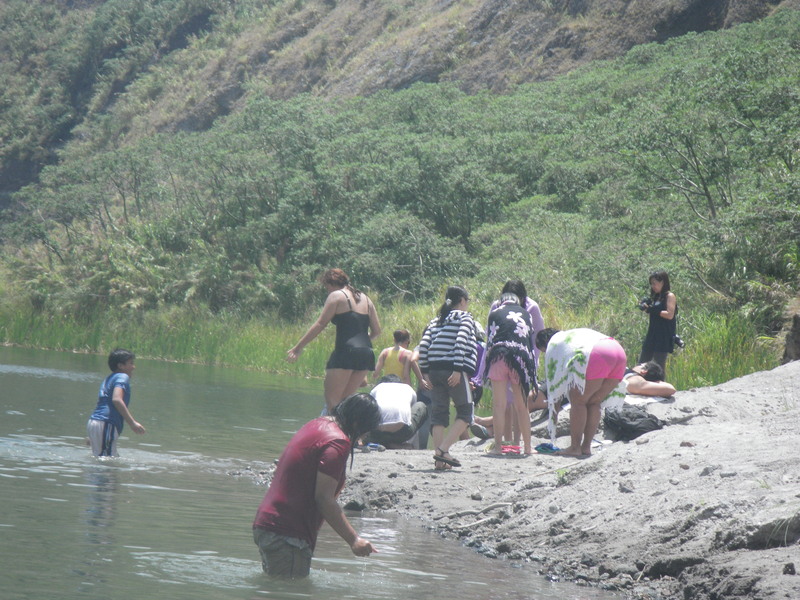 Some were in the water, but changing into swim wear was not an easy option, and the banks of the lake were really steep – it was caused by a volcanic explosion after all – so we stayed on the lake’s edges and paddled. A bit disappointing really, because the thought of plunging into cold water kept me going all the way there. We had started the day at 2.45am, waited in our building lobby one hour for the driver who didn’t actually show up until 4.30am. That put us at basecamp one hour late, and there were no more jeeps available to pick us up. We were 7 people, and the jeeps only hold 6 (so we were told) so we had to split be up into two parties when the first jeep was finally found, which probably meant we couldn’t all hike together. 45 minutes later, Helen, Latham and I were finally picked up by a driver who didn’t know where he was going. The back door was broken, the side doors opened by themselves. We stopped to help another jeep with a flat tyre that turned out to be our stranded friends. 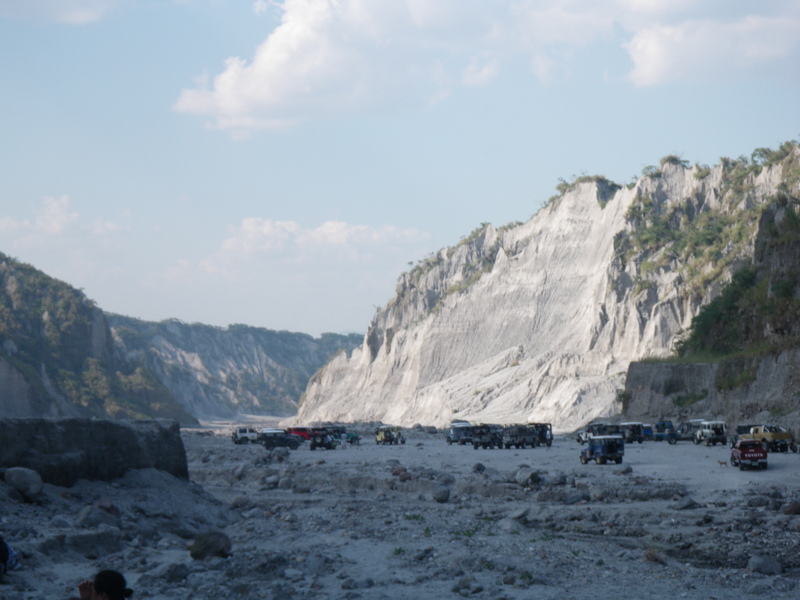 We all piled into our jeep, which now was magically holding 9: the driver, the 7 of us, their guide and our guide. That’s three in the front, four in the back, one guide on the bonnet and the other holding on to the back of the vehicle. Photos don’t begin to show the whole picture! The guide sat on the bonnet the entire time (with the other hanging off the back). How they stayed on is a mystery to me! 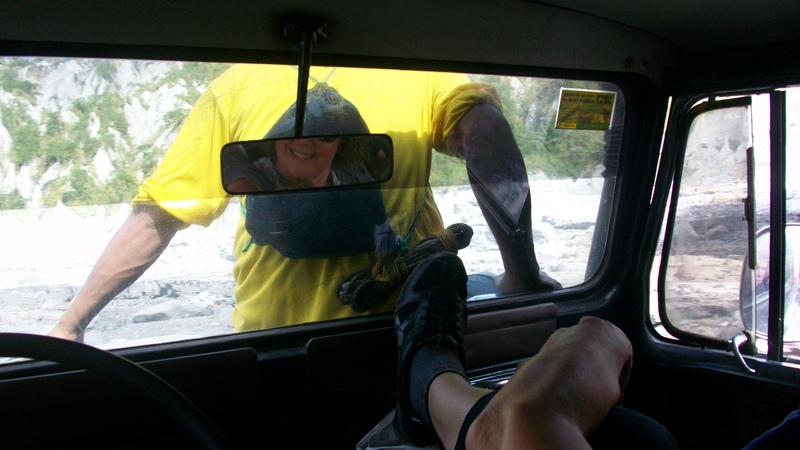 Being packed like sardines had its advantages when we drove in and out of river beds or bounced across dried mud and tire tracks. It stopped us flying around the vehicle as we were all jammed so close together. There were no handrails. The key fell out of the broken ignition on particularly bumpy spots, stalling the vehicle. The insides of the doors were missing, revealing the inner workings of the window and door handles. It was the crappiest, most abused vehicle I have ever traveled in. However, our experience wasn’t even close to one reported by others. 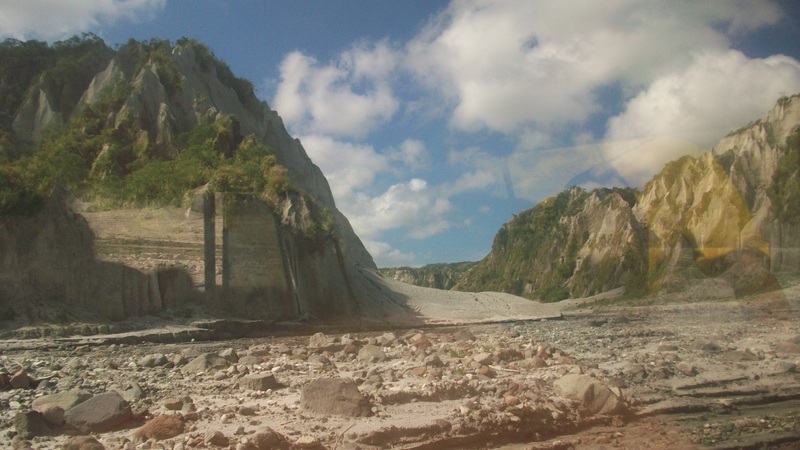 Other friends, coincidentally, had decided to visit Pinatubo that day. However, they had gone with a large group of about 30. Instead of supplying 5 jeeps to hold six-a-piece, some genius sent everyone out on a not-quite-large-enough bus, so some of the group had to sit on the roof. Of course, a long vehicle can’t handle the steep up and downs on the rugged trail, and after 20 minutes it got stuck out in the muddy, middle of nowhere. They were stranded in the lava fields for over two hours in the burning sun. They arrived at the crater lake, looking mighty pissed off, just as we were leaving. The day was long and tiring, filed with amazing vistas and memories of a unique experience, but marred by really terrible communication and horrible transportation. It’s not the first time I’ve experienced this type of thing here. But for the uninitiated, the challenge is thus: Going in you know that the trip will probably encounter unexpected difficulties. What they will be, and how bad they will be, is unknown. Forewarned may be forearmed, but often there is nothing much you can do. Do you say no to the next one? Or do you make the best call you can and go for the experience? Fantastic post. 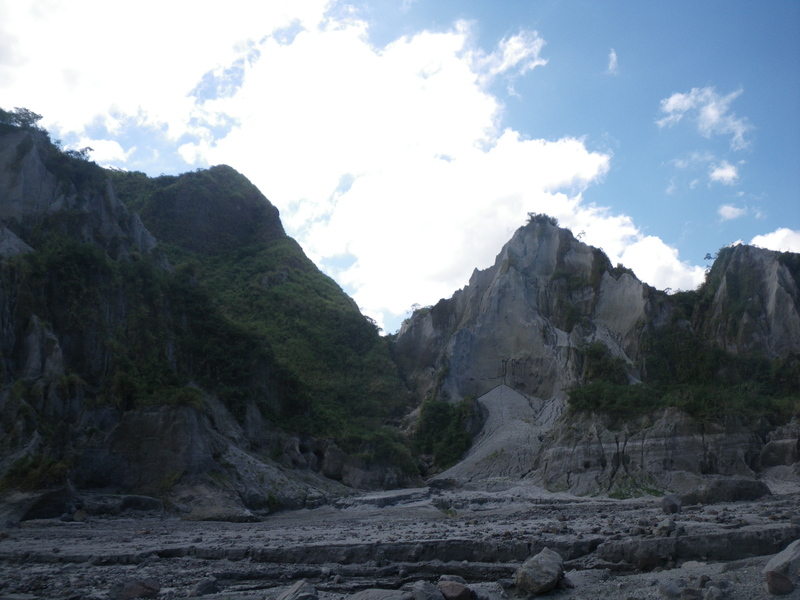 Rich tells me he remembers the 1991 eruption of Mount Pinatubo. I’m fascinated by volcanoes. 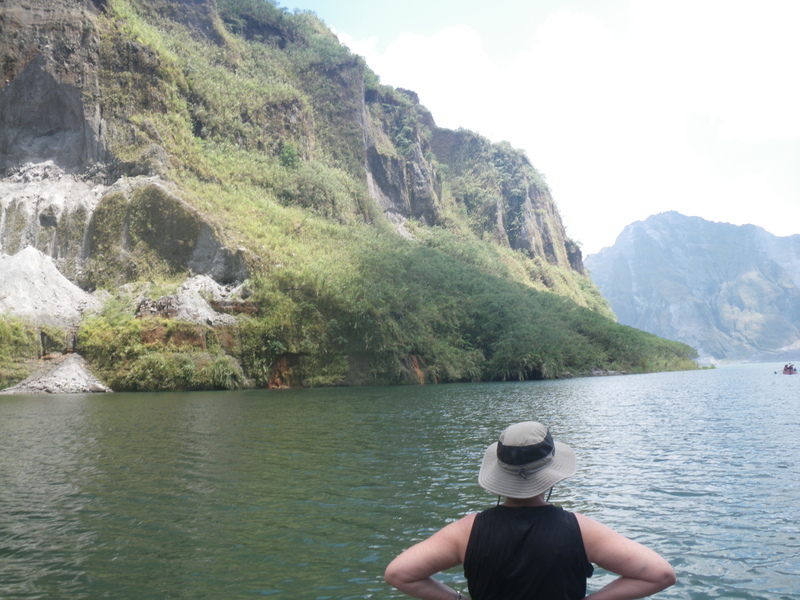 Just a couple of weeks ago I when inside the La Soufriere volcano on St Lucia.